It looks great next to your white MacBook, but is it worth your money? With so many portable hard drives to choose from, it's difficult for manufacturers to make theirs stand out from the crowd. Buffalo attempts to do so with the MiniStation Lite by beefing it up with software that increases transfer speeds, syncs files and encrypts data. But unfortunately only one of the three apps, TurboUSB, works on the Mac. The Buffalo MiniStation Lite is neat and stylish. It's small enough to carry around and is powered solely through the USB cable, so there's no external power supply to lug about. 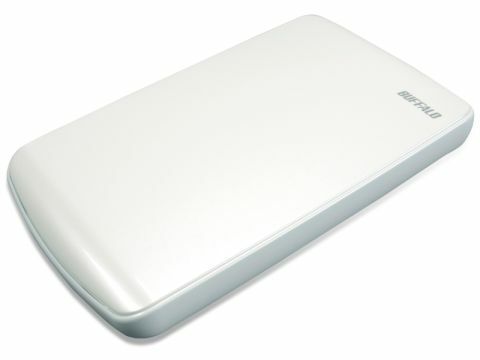 It's available in glossy black, white or red and in 250GB, 320GB or 500GB capacities. We're taking a closer look at the white 250GB model. It's claimed TurboUSB increases file transfer speed by 'up to 20%', though, in our benchmark tests, we found the increase was closer to 15%. Yet while the turbo-boosted figures were acceptable, they were not particularly amazing. Its sequential read/write speeds are 29.9 and 18.9 MB/sec respectively, with random read/writes scoring 11.8 and 15.2 MB/sec. However, this is ahead of Western Digital's My Passport Essential drive, which was run alongside it. There's nothing much wrong with the Buffalo MiniStation Lite 250GB, but if you're not distracted by the bundled software and relatively small speed advantages, you could get a bigger-capacity portable HDD for the same price. And to be honest, that's exactly what we'd do.